The cops theme or the series theme is developed and orchestrated in many styles but it is the only optimistic element in a very dark and disturbing atmospheric score filled with sadness, melancoly, nostalgia for guilt-ridden attorney David Farr and restrained and insidious horror for ex-actor and fanatic Gregory Praxas. You’ll notice many recurring gloomy musical devices like the low-key electric guitar riff that closes a scene or the brass (trumpets and trombones) effects through the screaming madness signature or the multi-register or the dual police siren motif and two pieces of source music: the rock music (see chapter 2 and 5) of the hippie band—Lindy’s Rock Bottom is composed of a drum, an electric bass guitar, an electric guitar and an electric piano—and the pre-recorded calliope solo (see chapter 4) of the marine terminal shops. Farr’s sorrow cues are re-used. Sociology-wise, the general music leaning is typical of the jazz fusion era (orchestral jazz and pointillistic dramatic music flavored with hippie rock through electric guitars and interwoven with Afro-Cuban rhythms and its percussions: claves, guiros and maracas) but it serves to showcase the methods of traditional policemen which is a cultural contradiction per se. Prior to that commission, Williams first collaborated with QM for Incident in San Francisco—considered as a blueprint for The Streets of San Francisco—and Travis Logan D.A. : two 1971 unsold pilots. Williams’ score for the pilot will influence a season 6 score from Mannix entitled “One Step to Midnight” (air date: November 12, 1972), in other words, Mannix is literally franciscofied! The pilot score will be tracked in the season 1 to come and Williams will remain the most prolific composer of that season with five strong scores: “The Thirty-Year Pin” (the greatest urban score of the bunch and faithful to the pilot’s trade mark), “Tower Beyond Tragedy”, “In the Midst of Strangers”, “Bitter Wine” and “Act of Duty”. From season 2 to 5, the amount of original music drops drastically and Williams only leaves a single composition each year. Apart from the composer, you find QM’s usual music staff: music supervisor John Elizalde—formerly working at Leslie Stevens’ Daystar Productions (Cf. Stoney Burke and The Outer Limits), then moved to QM Productions and who will write Frisco’s scores from season 1 to 5—and music editor Ken Wilhoit. San Francisco, California: a man jogging on the beach along with his black dog finds a floating dead body of a young woman. Mature Lieutenant Mike Stone and young Inspector Steve Keller arrive at the scene of the crime and discover the business card of attorney David J. Farr around the neck of the deceased one. They summon the dandy lawyer at the police precinct to know more about his link with the young woman named Holly Jean Berry but Farr remains vague, elusive and discreet. Farr drives out of the precinct on his yellow Jaguar while Insp. Keller watches him through the window. Insp. Keller senses that Farr hides something and could be the author of the crime. At his office, carrying a kid’s red cowboy boot, Chief of Inspectors Malone mentions the sordid Ramsey boy case to Lt. Stone which can be connected to the Donner woman one: two mutilated victims. Lt. Stone is compelled to work on two cases at once and the additional one is related to a killer with a beard. At the coroner’s office, the old medical examiner finds out that the Berry girl was neck chopped (“She died from a blow to the carotid artery”) and dumped into the bay. All the actors credits are in the onscreen order and I keep QM’s cast hierarchy. I only mention on purpose the main actors end credits. Scene: A man jogging on the beach along with his dog and sees a floating body. Cue: slow, sentimental and gentle music with a jazz trumpet when a grim electric guitar riff closes the piece. Scene: A brown Ford car starts full force, crosses the streets of San Francisco and heads to the beach when Lt. Stone and Insp. Keller come out followed by an ambulance. Cue: A furious and effective street funk tune rises up with a drumbeat, an alto sax, an electric guitar filtered with a wah wah pedal, an electric piano (clavinet), a fat brass section (this is the series theme). Scene: Lt. Stone removes the business card of attorney David Farr from the neck of the female victim. Cue: A brief sad piece of music executed by a keyboard, brass and an electric guitar. Scene: At the office of Lt. Stone, Insp. Keller describes the attitude of David Farr to his colleague. Cue: A brief mysterious and tense piece of music with strings. Scene: Attorney David J. Farr drives his yellow Jaguar down to the police precinct while Lt. Stone and Insp. Keller watch him coming. Cue: Smooth jazz-funk rendition of the series theme. Scene: David Farr walks back to his yellow jaguar, pauses a minute and drives away. Cue: Sad piece dominated by a keyboard and a flute. Scene: Insp. Keller drives Lt. Stone to the apartment building of the Berry girl. Cue: Another rendition of the series theme with a low-key instrumentation and still with the wah wah guitar and big brass. Scene: Lt. Stone informs Landlord Saretti about the death of Holly Jean Berry and he leads both cops to her apartment. He unlocks the door and lets them in. Cue: A martial lowkey piece with drum, maracas and brass. Scene: Landlord Saretti describes the yellow Jaguar of Holly Jean Berry’s boyfriend to both cops. Cue: A brief upbeat piece of amazement. Scene: David Farr drives his yellow Jaguar in the high streets and stops at the traffic light. Scene: David Farr thinks for a minute and remembers Holly Jean Berry. Cue: A brief melancolic piece with a keyboard. Scene: David Farr undergoes a trip down memory lane and remembers the society party where he meets rock singer Holly Jean Berry. Cue: Some hard rock music of the era is performed by a long hair hippie band called Lindy’s Rock Bottom. Scene: Holly Jean Berry asks David Farr to describe himself in the garden of the mansion. David gives his business card to Holly Jean Berry when he returns to the present time. Cue: Extented brief melancolic piece with a keyboard. Scene: The yellow Jaguar enters the parking garage of a building while Lt. Stone and Insp. Keller observe it at a remote distance. Farr is in the elevator and meets the two cops. Cue: Another rendition of the series theme. Scene: At night, Lt. Stone drives Insp. Keller to the Plantation Inn Motel. Cue: A fast-paced rendition of the series theme dominated by brass, piano and drums. Scene: Still at night, Lt. Stone drives Insp. Keller back to the precinct. They eat a pizza on their way to the bureau. Cue: A moody piece with an electric piano followed by a brief slow rendition of the series theme. Scene: The camera pans from the traffic to the gas station on Lombard where the two cops question the gas pump attendant about Del Berry. Cue: Another rendition of the series theme but with a dominant high register flute. Scene: Insp. Keller drives Lt. Stone and talk about Del Berry and heads to the building of Farr to meet the neighbor. Cue: Same rendition of the series theme but with a dominant low register flute. Scene: Insp. Keller and Lt. Stone question Farr’s neighbor Mr. Pyle about Holly Jean Berry. Cue: A brief gloomy closing piece. —Furious Lt. Mike Stone to Attorney David Farr. Scene: A station wagon drives down to a parking garage when David Farr comes out of the elevator and walks straight to the basement to face Lt. Stone. Cue: A moody piece executed by an electric guitar, brass and triangle followed by a brief slow-moving rendition of the series theme. Scene: Inside his yellow Jaguar, David Farr leaves Lt. Stone after an argument about a previous statement, takes a look at his rear-view mirror, undergoes a trip down memory lane again and remembers Holly Jean Berry that he used to meet in the elevator of his apartment building for a kiss. Cue: A brief lowkey brass passage followed by the keyboard melancolic piece. Scene: In his apartment, Farr gently questions Holly Jean Berry and then they kiss each other when she gets up and offers him to take a shower. Cue: A jazzistic happy tune with a brass section, flute, triangle and a piano. Scene: Holly Jean Berry is cooking some pancakes in the kitchen, looks at Farr and gives them to him. Cue: Intimistic piece executed by a flute, an electric piano and a brass section. Scene: Farr asks Holly Jean Berry what does she want to do? They look at each other. Only dressed with a trench coat, Holly Jean leaves the apartment, bumps into neighbor Larry Pyle, heads to her Beetle car to feed the parking meter and returns fast to the apartment. Cue: piano-oriented happy piece coupled with a flute, a triangle, a keyboard. Scene: Holly Jean Berry poses in an automatic photo booth located at the marine terminal, asks Farr to bring her to his apartment but he refuses cold but she begs him for a quarter in order to wrap his business card which will turn into his “swansong”. Cue: Source music dominated by a calliope and heard in the background. Scene: Farr returns to the present time and drives his yellow Jaguar out of the parking garage while Insp. Keller drives to Kenji Karate Studio. Cue: Brief gloomy piece followed by the series theme dominated by heavy percussions, a frantic flute, brass and an electric guitar. Scene: At Kenji Karate Studio, Lt. Stone and Insp. Keller leave David Farr feeling guilty of a crime. Cue: A slow gloomy rise dominated by a series of brass. —Singer Holly Jean Berry to Attorney David Farr. Scene: At night, a patrol car drives back to the police precinct while, at the bureau of inspectors, Lt. Stone and an inspector interrogate parolee Mr. Washington, carrying a beard. Cue: Another rendition on the series theme with a dominant upbeat brass. Scene: Lt. Stone hangs up the phone after a clash with David Farr and Insp. Keller makes an ironic remark about Farr’s attitude. They leave the bureau and head to the harbor. Cue: Subdued atmospheric piece followed by a slick percussion moody piece. Scene: Lt. Stone stops cold Insp. Keller on his way to illegally search the boat of David Farr and reminds him the use of a warrant. They leave the harbor. Cue: A brief lonely and gloomy piece composed of a brass solo. Scene: David Farr drives his yellow Jaguar in the hot and sleazy streets of San Francisco, passes by a street dancer hanged on a glass cage and playing with a serpent and he stops at a little tight street. Cue: A frenzy and nitty-gritty rendition of the series theme with a dominant electric guitar filtered with a funky wah wah pedal then a brass section and finally an electric piano. Scene: David Farr enters the Grass Roots club while Lindy’s Rock Bottom plays some rough rock music. Cue: Same rock music tune as in chapter 2 but with a different arrangement and an additional electric piano replacing the bass guitar. Scene: Lt. Stone remains stoic and worried at the news of the uncle’s black car. Cue: Grim piece with brass. Scene: The morning after, David Farr drives his yellow Jaguar on the harbor, stops, runs to his boat and unlocks the cabin. Mrs. Caswell observes him from her boat. Cue: The usual melancolic piece with a keyboard. Scene: Farr seems surprised to see the interior of his boat, pauses and runs in a hurry. The Caswells watch him leave the marina. Cue: Loud brass punctuation followed by a low end piano and a suspenseful passage. Scene: Lt. Stone and Insp. Keller take a close look at the messy interior of the boat that contains torture evidence (syringe, bonds and Holly Jean Berry’s yellow belt). Cue: Low-key and mysterious piece dominated by a flute. Scene: Looking at his colleague and the cabin, Lt. Stone states the arrest of David Farr on suspicion of murder. Cue: Dramatic closing piece executed by brass. To be continued. Read Part II to unfold Chapter VI to X.
I loved the funkiness of his Streets of San Francisco music, but alas I doubt we'll ever hear any of it on a stand-alone CD. He was able to write some catchy, memorable themes too - witness Lou Grant and The Magician. His jazz-rock/big band album Threshold is excellent and re-issued a while back. I haven't seen this show in nearly thirty years and I also tend not to like "straight-ahead" cop programs. 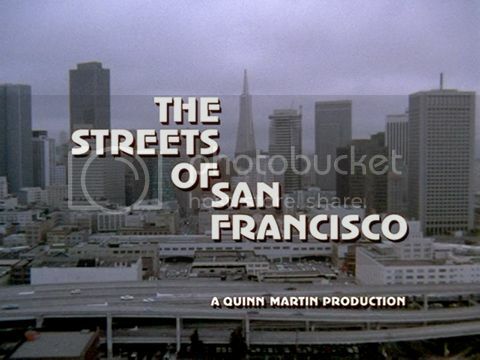 However, "Streets" exists in the time frame of my favorite era for TV so maybe it's time I watched it again. In reading the episode synopses, it does have a certain grittiness about it thanks to the location shooting. Read Part II in which you can read about the contents of the pilots. One of STREETS central theme is the madman, especially during season 1. Please order the DVD for season 1: it's all gritty Seventies. FIVE-O is a straight-ahead cop series? Kritzerland head Bruce Kimmel enjoys Pat Williams. If you like the funkiness of STREETS, watch a MANNIX episode that I mentioned: same leaning. Yes, thanks for a nice and interesting blog! 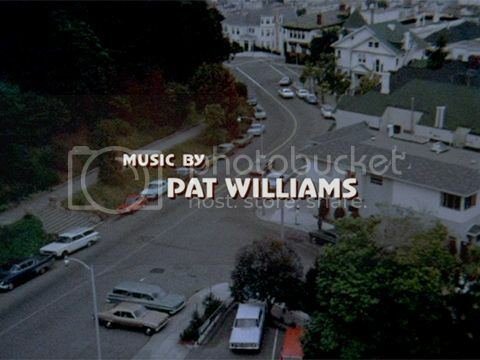 This music and the Columbo score "Make Me a Perfect Murder" are the best things I have heard scored by Williams. Will this ever be available on CD? Very cool blog posts (1 & 2), Thomas. Thanks.